Chrissy took to Twitter a little while ago, to let everybody know she’d left her underwear on the plane. She kindly suggested that should anyone find her missing bra, they could totally keep it! “If you are flying out of DC on Virgin today, check under your seat for a very large mom bra. It’s like a talk show giveaway!” she tweeted. Quite right she is, although we’re betting it had never occurred to Oprah or Ellen to gift their audience a slightly used pregnant lady’s bra. Watch this space, though, because these things catch on in a heartbeat and before you know it there’ll be mum bras for all! If you are flying out of DC on virgin today, check under your seat for a very large mom bra. It’s like a talk show giveaway! Warnings to keep loose items safely contained went unheeded by Chrissy, as she unstowed herself and shoved the mum-torture-device out of sight and mind. Where it stayed. Chrissy’s followers were weirdly delighted by this turn of events, hoping to helpfully spread the lost bra news, share bras-off stories – or even find the bra and cash it in on eBay. “Girl! I love that you free boobed on your flight!! Gotta let them breathe!” one follower wrote. “Good to know I’m not the only mom to leave my sh*t everywhere I go,” another mum empathised. “YOU get a bra! And YOU get a bra!” an Oprah-pretender posted. “Please tell me you whipped that sucker out of your sleeve in the middle of the flight and shoved it under the seat,” a fellow bra magician wrote. 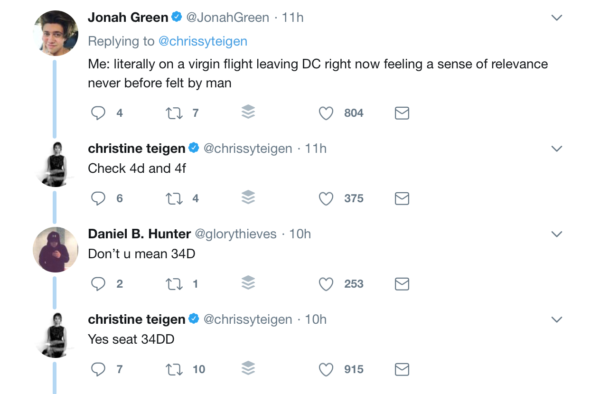 Chrissy herself suggested those flying on Virgin check seat 34DD … Boom-tish! the most important thing in the smithsonian if you ask me – jerry's puffy shirt! Enjoying her own genius. And John.